When I ran for Commissioner in 2012, it was because I believed that, with the demise of the $750,000 Comp Plan that citizens and staff had spent years developing, the county had suffered a collapse of long-term planning and thinking. I ran because I believe that local government should inspire residents to envision a fair and healthy county. I ran to restore public trust and confidence in County government. I believe we are now moving in the right direction. Do you want to hear a scary statistic? Our county population is projected to explode from our current 54,000 residents to an estimated 85,000 by 2035. To preserve our county’s beauty and health, to keep this home to both wild life and ranchers, to attract high quality employers, we need to plan carefully. Everything I do is with an eye to the future, to preserve and improve this county so that my kids – and yours! – will have great jobs in a still stunning, still friendly place. I supported the creation of the La Plata County Water Advisory Commission to aide the county both in planning for, and protecting, our waters. I sponsored the Public Lands Resolution, which passed unanimously, calling for maintaining federal ownership of our public lands. I advocated strongly in DC for passage of the Hermosa Creek Watershed Protection Act, critical to our tourism industry. I supported convening a Fiscal Sustainability Steering Committee to help the commissioners plan for the county’s financial future. I led the county in developing strong state air quality standards and the nation’s first rule controlling methane emissions from oil and gas operations. I testified in Washington DC in support of the BLM’s Venting and Flaring Rule to reduce emissions and protect the US Treasury. I served as co-chair of Hickenlooper’s Oil & Gas Task Force and fought hard to maintain the authority of local governments to regulate O&G operations. I have been serving on the boards of San Juan Basin Health and Housing Solutions for the Southwest. I advocate daily for diversifying our economy so we are not so dependent on any single industry. I’ve worked with residents and local businesses to strengthen our local foods economy, support community garden projects, and promote sound food policy by creating the Herbicide Carryover Working Group to educate growers and the community about the risks certain herbicides pose to gardens and farms in our region. I promoted the first community solar garden development on the Boys & Girls Club rooftop. Without long-term planning, every decision is a decision all by itself; we don’t learn from our failures nor build on our successes. I believe that long-term planning – having a comprehensive plan about where to encourage development and all the infrastructure needed to support it – protects and strengthens property values. That’s why I pushed so hard for the County to re-engage in citizen-based dialogue through the Planning Commission. Just as we wouldn’t begin building a home without architectural drawings, we shouldn’t be building out our county’s beautiful lands without great care given to designing for the result we want to achieve. Revenues from natural gas development are low due to national lack of demand, but the need for county services never goes away. Our increasing population impacts our county roads and bridges, the sheriff’s office, human services, and the building, planning, and engineering departments tasked with making growth viable. refer a measure to the Nov 2016 ballot to increase property taxes – we are proposing that the property tax mill levy be increased from 8.4 mills up to an additional 2.4 mills to help fund the road and bridge department. adopt impact fees for new development, which I strongly support. Though currently toxic, our local environmental problems could actually stimulate local jobs and growth. Methane Emissions. The La Plata County and San Juan County NM region is the “reddest spot on the map” in the US due to our extraordinary methane emissions. We need an Apollo-like effort bringing local, state, and federal governments together with businesses and organizations to reduce emissions. Improving our regional air quality will safeguard our personal health and create potentially thousands of new jobs. Acid mine drainage in the Animas River. 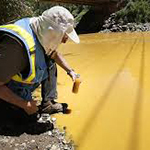 Cleaning up the abandoned mines above Silverton in order to restore the quality of the Animas River has long been a priority of mine – remember, the mines are collectively leaking more than 3 million gallons of acid into the Animas each year. Since the Gold King Mine accident, I’ve played a key role working with the EPA and upstream as well as downstream governments to address both the spill and plan for the future. I have advocated for an ongoing water quality and sediment testing and monitoring plan, a cleanup plan, and testing for a more comprehensive range of potential contaminants. I have also called for the passage of H.R. 963, the Hardrock Mining Reform and Reclamation Act of 2015 which would create a fund to clean up abandoned and inactive mines by establishing an 8 percent royalty on all new hard-rock mines on public lands, a 4 percent royalty on existing mines on public lands and reclamation fees on all hard-rock mines, including those that were “purchased” for pennies under the 1872 Mining Law. Montana’s experience with abandoned mine restoration projects suggests that mine reclamation can create more jobs per dollar spent than mining itself. 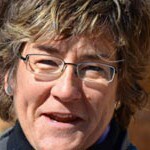 I have been responsive to public concerns, both large and small – whether it’s been citizens wanting to ensure funding for the Sunnyside and Fort Lewis libraries, or a dangerous road intersection needing some additional signage, or too much commercial traffic to and from mines, or too many bears in too many trashcans, I have acted. There are no easy answers. I’m hoping that together we can determine how we can effectively deal with these issues without breaking the bank or increasing the budget – how we can make improvements without adding additional staff.